When choosing a SleepSafe® Bed, we want you and your loved ones to rest in a comfortable and safe environment, so with the advice from care giving professionals and listening to the needs of our clients, SleepSafe® Beds, has created durable medical equipment (DME) safety bed, that meets or exceeds the FDA guidelines on entrapment and falls. CHOICE #1 – Which SleepSafe® bed model will suit your needs? Our durable medical equipment (DME) safety beds have one distinct difference — the HEIGHT OF THE SAFETY RAIL PROTECTION above the mattress. This choice should be made based on the activity level of the user. How active are they? How much safety rail above the mattress is needed? Can they sit up? Can they pull to kneel or stand in the bed? Keeping this in mind will help you and your doctor determine which bed is most appropriate. Also, you will need to order your bed with or without padding. • The SleepSafe® – BASIC Bed safety rail height range is 19″ to 23¼” depending on configuration. 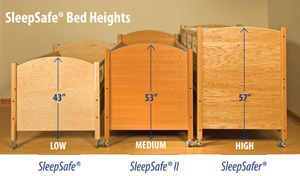 • The SleepSafe® – Low Bed safety rail height range is 8¼” to 17¼” depending on configuration. • The SleepSafe® II – Medium Bed safety rail height range is 13¼” to 27″ depending on configuration. • The SleepSafer® – Tall Bed safety rail height range is 18¼” to 36¼” depending on configuration. 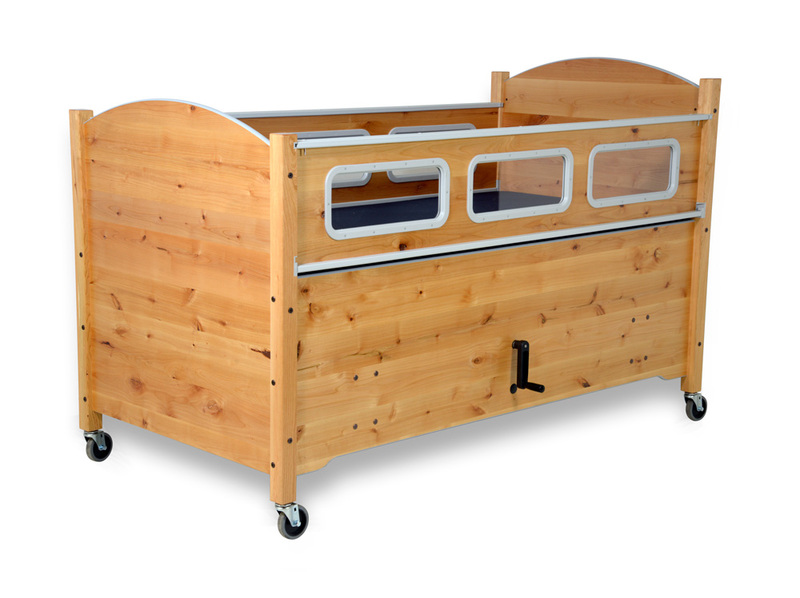 • The SleepSafer® – Tall Bed with an Extension adds 16¾” of safety rail height. It is important to also consider TRANSFER HEIGHT. • The SleepSafe® – BASIC Bed transfer height is 22¼” with safety rail on. 20¼” with safety rail off. • The SleepSafe® – Low Bed transfer height is 22¼“ with safety rail on. 20¼“ with safety rail off. 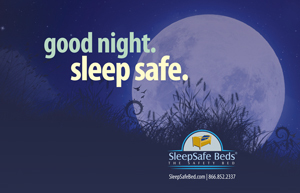 • The SleepSafe® II – Medium Bed transfer height is 32″ with safety rail on. 30½” safety rail off. • The SleepSafer® – Tall Bed transfer height is 26″ with safety rail on. 24½” with safety rail off. 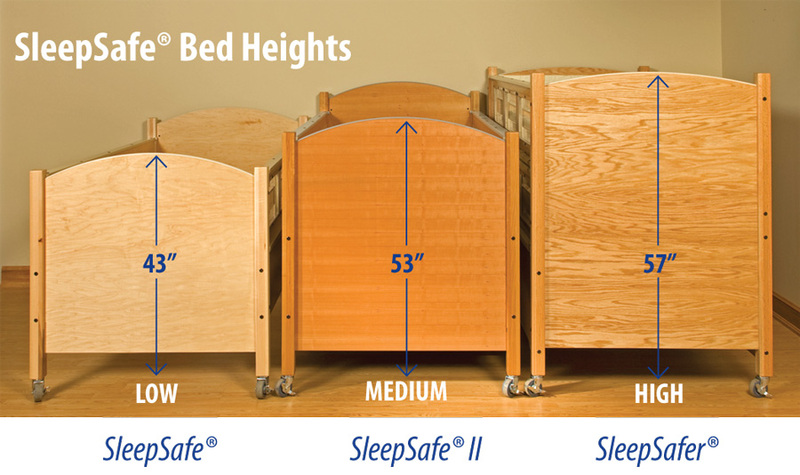 For a complete comparison of bed models, please visit our SleepSafe® Bed Specifications. 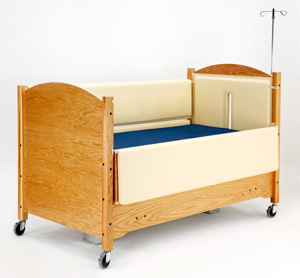 As shown, each bed offers increased safety rail height and level of protection. When you line the 3 different beds side by side you will see that each one gets taller than the next. CHOICE #2 – What features or functions do you need in a foundation? Select the features and functions that will best suit your needs. • FIXED FOUNDATION offers a foundation with a fixed height and NO articulation or HI-LO features. The mattress will lie flat on a box spring or bunkie board. Depending on the bed model chosen, you will have more than one choice for positioning that fixed height at the time of installation. • The SleepSafe® – BASIC Bed offers 1 fixed height option. Bunkie Board only. 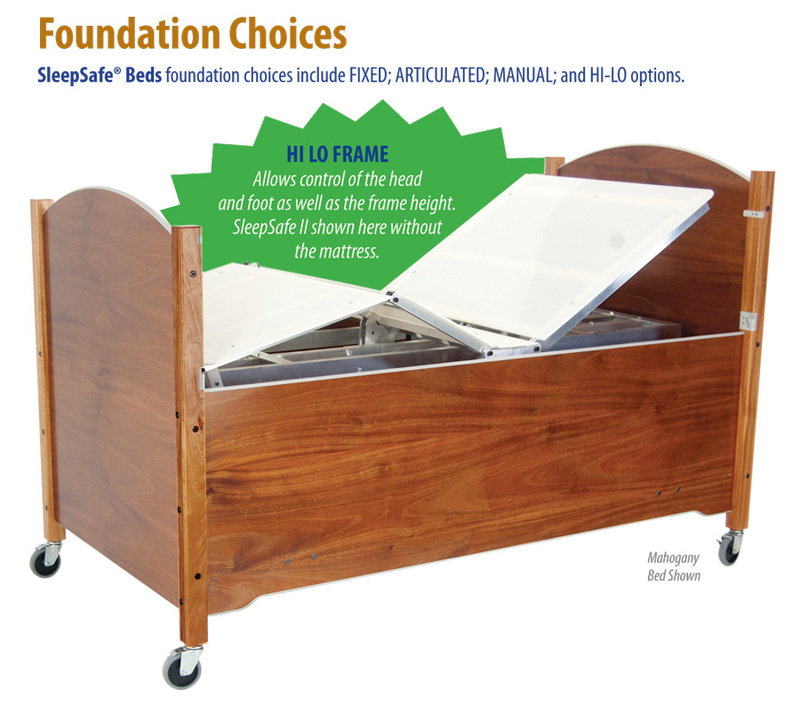 • The SleepSafe® – Low Bed offers 2 different fixed height options. • The SleepSafe® II – Medium Bed offers 2 or 3 different fixed height options. • The SleepSafer® – Tall Bed offers 2 different fixed height options. The height/positioning choice you make when installing the fixed foundation will determine the height of safety rail protection above the mattress. Example, if you choose to install at the lower position, this will increase the height of protection above the mattress. You may change the height of your fixed foundation at any time. NOTE: You have a choice when choosing the Fixed foundation of a box spring or bunkie board. There is NO cost or comfort difference between the two options. The only difference in the two is the depth of each. A bunkie board offers approximately 5″ more of safety rail protection. • NEW! MANUAL FOUNDATION offers four choices. The hand cranks use a hydraulic system and are easy to use with little effort by the operating caregiver. Note: The hand crank handles fold up into the handle’s shaft. Manual Hi-Lo Foundation without the Articulating feature. This will raise and lower the mattress height with one crank located in the front panel of the bed below the safety rail. Manual Articulating Foundation without the Hi-Lo feature. This will raise and lower the head and/or knee section of the bed with a combination of two cranks located in the front panel of the bed below the safety rail. Manual Hi-Low Foundation with the Articulating feature. This will raise and lower the mattress height and raise and lower the head and knee section of the bed with a combination of three cranks located in the front panel of the bed below the safety rail. With a hydraulic system, the hand cranks are easy to use with minimal effort by the caregiver. • ARTICULATED FOUNDATION offers an electric frame with a fixed height. This foundation features head and knee elevation by remote control. With the touch of a button, you can elevate the head and/or knee section of the bed. As in the Fixed foundation, there are more than one height positions to choose at time of installation. The height/positioning choice you make when installing the Articulated foundation will determine the height of safety rail protection above the mattress. Example, if you choose to install at the lower position, this will increase the height of protection above the mattress. You may change the height of your fixed foundation at any time. • HI-LO FOUNDATION offers a Hi-Lo electric frame as your foundation with FULL articulation. Not only does the head and knee section elevate, but the Hi-Lo feature allows the mattress surface to be raised or lowered by remote control. This is considered a fully electric bed. Depending on where you position the mattress within the frame will determine the amount of safety rail protection above the mattress. When lowered all the way down you will maximize the rail height above the mattress. As you begin to raise the mattress from the floor, you will decrease that safety rail height above the mattress. With the Hi-Lo foundation, you can position the mattress anywhere within the range of motion of the frame. CHOICE #3 – What bed size is most appropriate? The following durable medical equipment (DME) bed sizes are available for SleepSafe® Beds. Mattresses support up to 350 lbs. • TWIN offers a standard twin bed size. Mattress size is 38″ by 77″. ALL twin sized beds are available with all available foundations. • FULL offers a standard full bed size. Mattress size is 51″ by 77″. ALL full sized beds are available with all available foundations. • QUEEN offers a standard queen bed size. Mattress size is 61″ by 77″. ALL queen sized beds are available with all available foundations. CHOICE #4 – What wood finish would compliment your room best? 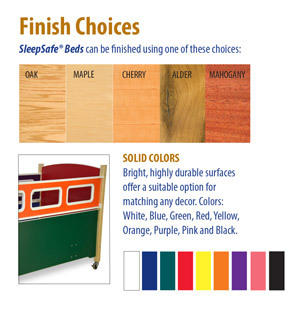 The following wood choices are available for all SleepSafe® Beds. Please note that our beds are made with natural wood with a clear finish. We do not use a stain or paint, allowing the natural beauty of the wood to shine through a protective clear finish. • ALDER is a rustic birch with random knots and straight grain. It is moderately light with a clear, natural finish. • MAPLE is the lightest of wood choices and shows very little wood grain. • OAK is a bit darker than the maple, but relatively light in color and shows more natural wood grain. • CHERRY is slightly darker than Maple and Oak but again, is still relatively light in color. Many people tend think of the dark cherry stain when thinking of cherry, but remember this is the natural wood with no stain finish, however, over time, cherry wood will darken naturally over the years. • MAHOGANY should be the darkest of the wood choices but mahogany finishes will vary significantly. We use an African Mahogany which is naturally lighter than typical dark Mahogany. The color will darken with time. We clear coat the wood to bring out the wood’s beautiful grain. • MIXED or SOLID COLORS are now available! The colors of the bed components can be mixed and matched for the combination of your choice. 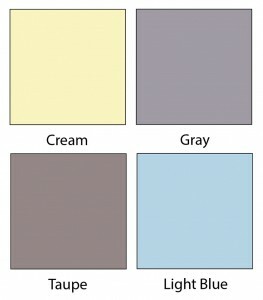 Colors include solid White, Blue, Green, Red, Yellow, Orange, Purple and Black. All leg posts are available in Maple only. Leg posts are not available in colors. Contact us or talk to your local distributor for details. CHOICE #5 – Do you need any additional accessories? • PADDING: Very Important : When ordering your bed, you will need to order your SleepSafe® Bed with or without padding depending on your needs. Our beds are now sized and manufactured accordingly. It is important to make this determination when you order your bed as retrofitting your bed in the future will be costly. If you order padding, it will be installed at the factory and will cover ALL four sides. Padding only one or two sides is NOT an option. If you order padding with your bed, it is very important to NEVER use the bed if you have removed one or more of the pads. If you remove ANY of the pads, a gap will be created between the mattress and the sides of the bed potentially creating a risk for entrapment. • NEW! MESH SCREENED WINDOWS CAN NOW BE INSTALLED IN THE SAFETY RAILS instead of the traditional clear windows. • IV POLE can be installed anywhere on the footboard or headboard. It is a 30 inch stainless steel pole with 2 ram hooks. • MEDICAL TUBING can be accessed through a 2″ by 18″ vertical hole cut from the headboard. • HEADBOARD WINDOW is available for installation in the headboard. • FOOTBOARD WINDOW is available for installation in the footboard. • EXTENDED ENCLOSURE – CLOSED will add a top securely onto the Extended Enclosure. • DUAL VIEW SAFETY RAILS for HIGH BED offers 2 additional safety rails, replacing the solid wood panel on the standard SleepSafer high bed, allowing access from both sides of the bed. 2. Premium Mattress: Our CertiPUR-US memory foam mattress provides remarkable comfort and support. The gel polymers in the memory foam help keep the mattress cooler to keep the user’s body temperature normal. Covered in fluid-resistant, anti-microbial/anti-bacterial, fire-retardant stretch Nylon fabric, the mattress provides unique comfort zones for support and pressure relief. 4. Foundation of choice: Box spring or bunkie board (Fixed models), manual crank (Articulated), or electric frame (Articulated or HiLo models). All of our beds are custom built to order. It is important to order the correct bed the first time. If you are still unsure about which bed model is right for you, please call us directly, toll free, 866-852-2337, so we may help you make the right choice. Thank you! Click to view or print PDF. 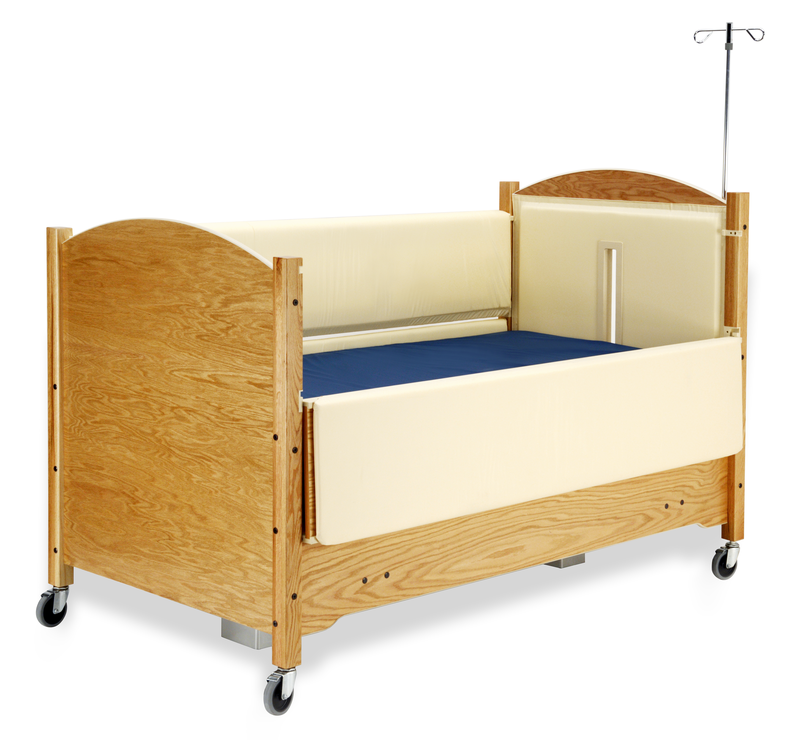 SleepSafe® BASIC Safety Bed offers lower transfer height and more safety rail protection. SleepSafer® Bed with Standard Flip-Up Extension. SleepSafe® II Bed in Oak with Pads over the windows. Shows IV Pole with cut out for IV tubing.